YouTube Kids has had some, um, problems with inappropriate, disturbing and sometimes downright gruesome content slipping past the algorithms created to keep young viewers safe. Videos of Peppa Pig drinking bleach. Mickey snipping off girls’ bikini tops at the beach. Conspiracy theories claiming the moon landing was a hoax. Sure, there are tools to block certain channels and turn off the search function, but parents have been generally wary of the grab bag-like nature of the app. Finally, YouTube Kids is going with the solution that remains the most trusted one: humans. Starting this week, when you make the choice to turn off the search option, you are limiting the content to channels that have been verified by a real-life team of reviewers—not an algorithm. A couple quick thoughts: 1) This is a welcome change. And 2) To the employees whose job it is to sit through countless hours of Little Baby Bum, I am so sorry. Thank you for your sacrifice. Tap the Lock icon in the bottom corner of any page in the app. Read and enter the numbers that appear or enter your custom passcode. Under Content Controls, tap the Search slide so that it’s off. Also this week, in your child’s profile settings, you’ll be able select curated collections of channels, including DIY, gaming and Sesame Street. 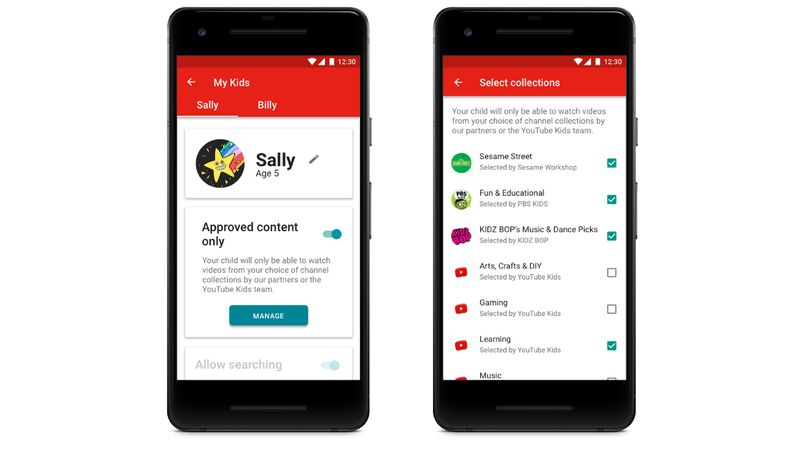 And later this year, YouTube Kids will be launching another feature that will let you handpick every video and channel that your kid can watch in the app. These are some good steps by the video platform, but I’m wondering if they’re coming a little too late. Parents who’ve witnessed creepy Peppa Pig and Spider-Man knock-offs on their kids’ screens might not be able to shake those images, and YouTube itself is riddled with other issues, including an FTC complaint claiming that the Google-owned platform is improperly collecting personal data from children. We’ll have to see whether the new controls will be enough for parents to hand over the iPad.